یکی از مهمترین پارامترهایی که در یک پروژه تونل سازی شهری باید مورد بررسی قرار گیرد، میزان نشست سطح زمین است. تونل های مترو از مهم ترین زیر ساخت های حمل و نقل شهری هستند. با توجه به عمق کم حفاری مهم ترین عامل, کنترل تغییر شکل ها و نیروهای برشی ایجاد شده برای جلوگیری از نشست حداکثر است تا از آسیب و تخریب سازه های سطحی و زیرسطحی جلوگیری شود. تاکنون روش های مختلفی برای تخمین نشست ارائه شده است که به سه دسته روابط تجربی (EMPERICAL METHOD) روابط تحلیلی (ANALYTHICAL METHOD) و روابط عددی (NUMERICAL METHOD) تقسیم می شوند. 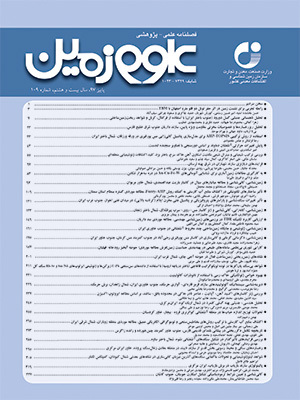 در این تحقیق با توجه به شرایط ژئومکانیکی محل مورد مطالعه و با استفاده از برداشت های انجام گرفته در رفتارنگاری حین حفر تونل مترو دو قلو توسط TBM رابطه نشست زمین ( s=A_2+s_max/2 ) , نشست ماکزیمم) s_max=A_1-A_2 ( و نقطه عطف ( ⅈ=x_0) بر اساس تابع بولتزمان برای تونل مترو دو قلو اصفهان ارائه شد. کلمات کلیدی: نشست، نشست ماکزیمم، نقطه عطف، روابط تجربی، روابط تحلیلی، روابط عددی، TBM. Subsidence prediction for twin tunnels using empirical formula – A case study: Isfahan, Iran. In the urban tunneling project, one of the most important parameters to be considered is the subsidence level. Metro tunnels are one of the most important urban transportation infrastructures. Due to shallow depth of drilling, the most important factors to prevent the maximum subsidence and subsequent damage of surface and subsurface structures are deformation control and shear forces. The various methods of estimating the subsidence are divided in three categories, namely; Empirical, analytical and numerical methods. In this research, according to the geotechnical conditions of the study area using the data collected from the monitoring during the excavation of twin tunnels of metro by TBM, the empirical methods for the subsidence ( s=A_2+s_max/2 ), the maximum subsidence (s_max=A_1-A_2 ) and the inflection point (ⅈ=x_0 ) are presented by using Boltzmann function for Isfahan twin metro tunnel. Keywords: Subsidence, Maximum subsidence, Inflection point, Empirical Method, Analytical Method, Numerical Method, TBM. Attewell, P. B., Yeates, J. and Selby, A. R., 1986- Soil Movements Induced by Tunnelling. Chapman & Hall، New York. Chakeri, H., Ozcelik, Y. and Unver, B., 2013- Hacettepe University, Effects of important factors on surface settlement prediction for metro tunnel excavated by EPB. Ankara. Mair, R. J. and Tailor, R. N., 1993- Surface Settlement Profiles Above Tunnels In Clay. Journal Of Geotechnique, Vol, 37. No.3, pp. 301- 330. O’Reilly, M. P. and New, B. M., 1982- Settlements above tunnels in United Kingdom their magnitude and prediction. Tunnelling 82 symposium, London IMM, pp.173– 181. Oteo, C. S. and Moya, J. F., 1979- Evaluacion de Parametors Del Suelo de Madrid Con Relacion a la Construccion de Tuneles. In Proceedins of the 7th European Conference on Soil Mechanics and Foundation Engineering. Paper f 13, vol, 3. pp. 239- 247. Peck, R. B., 1969- Deep excavations and tunneling in soft ground. In: Proc. 7th International Conference on Soil Mechanics and Foundation Engineering, Mexico City, State of the Art Volume, pp. 225– 290. Rostami, A. H., 2017- Estimation of settlements induced in tunneling with TBM in Urban Environments. Case study: Isfahan Subway Line 1. Ph.D. Unpublished, Ph.D. Thesis in Mining Engineering.